Below you can find detailed instructions on how to export a distribution certificate from your Keychain. If you'd like us to publish the app in your developer's accounts, in addition to access credentials we'll need your iOS distribution certificate that we'll be using for signing the app. 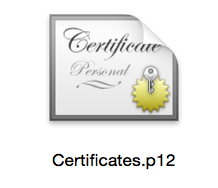 A .p12 file is a specially-formatted and encrypted file that contains your distribution certificate. App Store Connect checks for this file when you submit an app and will only accept the app if it contains a .p12 file that matches what you have configured in your App Store Connect account. 1. 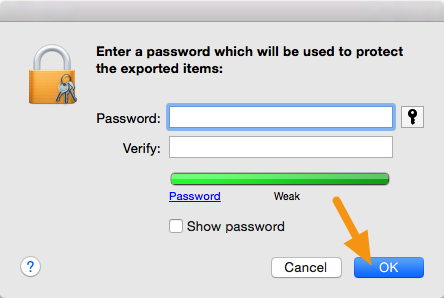 On your Mac, launch Keychain Access, select the certificate entry and right-click on it to select "Export." All certificates you have installed will be in the "login" keychain (Label 1) under the category "My Certificates" (Label 2). 2. In the window that appears, make sure the File Format is set to "Personal Information Exchange (.p12)" and click on "Save" to save it to your machine. 3. When asked for a password, leave it blank and click on "Ok."
4. When asked for the computer password, enter it and click on "Allow." 5. Your .p12 file will be saved in the location you specified.